Prominent shorts helmer Jean-Gabriel Periot makes a welcome transition to feature-length documentaries with A German Youth, a thought-provoking look at the Baader-Meinhof group and the political debates of the era. While the people and events are hardly cinema newcomers, this entirely found-footage work takes a different tack, situating the clique and the Red Army Faction within postwar German debates: How was democracy understood in a nation recovering from fascism? Periot’s superb editing, long one of the hallmarks of his award-winning shorts, is much in evidence, and while the direct, post-1970s consequences are left out, intelligent audiences can’t fail to make parallels with today. - Jay Weissberg, Variety, 25 February 2015. With much of the public discourse on movies dominated by comic book franchises and awards ceremonies, it’s hard to imagine a time when filmmaking was seen as a radically political art form. But back in the 1960’s and 70's, there were some aspiring directors who thought their work would change the world. And there were others who went from making films to trying to make a revolution, taking up arms against the man. At least that was the case in Germany, as evidenced by the reams of archive footage assembled by French filmmaker Jean-Gabriel Periot into his captivating feature debut, A German Youth. Exploring the rise and fall of the Baader-Meinhof Group (aka the Red Army Faction) through student movies, protest films, news broadcasts and other audio-visual records of the epoch, this densely layered documentary reveals how members of a disillusioned post-war generation gradually transformed into left-wing militants whose actions would have deadly consequences for all involved. Covering the decade stretching from 1965 to 1975 – a period that saw leftist movements sprout up in the U.S. (the Vietnam War protests), France (May ’68), Italy (The Red Brigades) and elsewhere – Periot begins by providing context for what would happen in Germany, where children born before or during WWII were raised by authority figures they could no longer trust. “Parents have lost their credibility due to their identification with Nazism,” claims the highly articulate Ulrike Marie Meinhof, who worked as a journalist for a left-wing magazine, and also directed a few short films, before co-founding the RAF along with artists-turned-radicals Andreas Baader and Gudrun Ensslin, and the lawyer Horst Mahler. At the same time that West Germans took to the streets, the Berlin-based DFFB film school was founded, and some of its pupils quickly joined the fight. 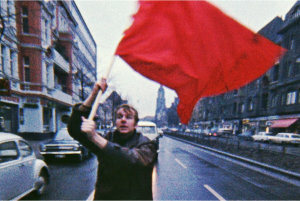 Among them were Holger Meins, whose various short movies – artful pieces of left-wing agitprop – are intercut with coverage of events that gave rise to the student-led revolution, including the killing of Benno Ohnesorg by riot police and the shooting of Marxist agitator Rudi Dutshke by the anti-communist Josef Bachmann. These two incidents, along with growing protests against news magnate Axel Springer (a sort of German Rupert Murdoch of the time) would inspire the Baader-Meinhof Gang to take action in 1970. While the exploits of Baader-Meinhof and similar groups would have a major political impact throughout the decade, Periot also reveals how certain filmmakers of the era – including Jean-Luc Godard, Michelangelo Antonioni and Rainer Werner Fassbinder – found themselves mixed up in the movement, either making their own radical films like Godard or contextualizing it as Antonioni did in Zabriskie Point. - Jordan Mintzer, The Hollywood Reporter, 12 February 2015.